What land will it cover? The proposed Greenbelt covers a wide swath of countryside from Northumberland County to Niagara Region, a total of over 760,000 hectares. 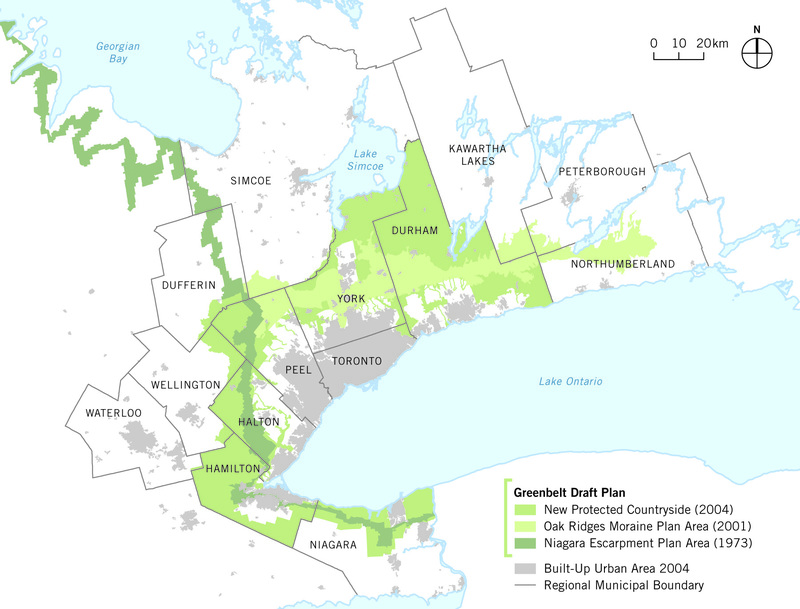 Slightly less than half of the lands are already protected under the Oak Ridges Moraine Conservation Plan and the Niagara Escarpment Plan, to which the new act would add over 400,000 hectares. The area includes hundreds of working farms, as well as wetlands, woods, river valleys, and open green space. The Greenbelt includes almost no land north or west of the Regional Municipalities that make up the Greater Toronto Area. This is the result of the government's earlier decision to confine the Greenbelt Study Area to the southern part of the region. Within the Greenbelt area, the Plan would generally prohibit the re-designation of farmland or green space to allow urban development. It would also prevent development next to rivers, lakes, and wetlands, or next to parks and farms, and promote the creation of parks and recreational trails. The Plan would govern land use in the area it covers. All other planning documents would have to conform to what it says. Lands within the Greenbelt would be classified into four categories -- agricultural, natural, settlement areas, and open space -- with specific policies applying to each. What activities will be permitted inside the Greenbelt? Existing land uses within the Greenbelt would continue. Some additional development would be permitted in and around existing towns and hamlets, provided that there is sufficient infrastructure to support it and that it does not encroach on natural heritage features or specialty crop areas.